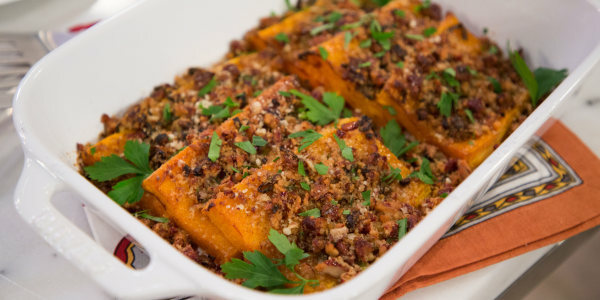 Nothing says fall like butternut squash! Don't be intimidated by cutting hard-shelled butternut squashes that just happen to be popping up in supermarket bins everywhere these days. When it comes to cooking this seasonal staple, practice makes perfect and will also unlock a world of fall flavors for soups, pasta, sides, salads, desserts and more. While some people look forward to the turkey on Thanksgiving and others can't wait to get their hands on some pie, it's not unusual for butternut squash to get (almost) all gobbled up before the host sits down. From butternut squash soup to butternut squash pasta, here are 15 delicious butternut squash recipes to try this Thanksgiving. "I love the combo of pecans and Parmesan together," cookbook author and TV personality Daphne Oz told TODAY Food. "It gives a wonderfully rich, textured crispness to the soft roasted squash without using bread." Oz's butternut squash casserole recipe is perfect for a Thanksgiving side dish and works equally well as a main course for vegetarians. Sometimes grandma just knows best! 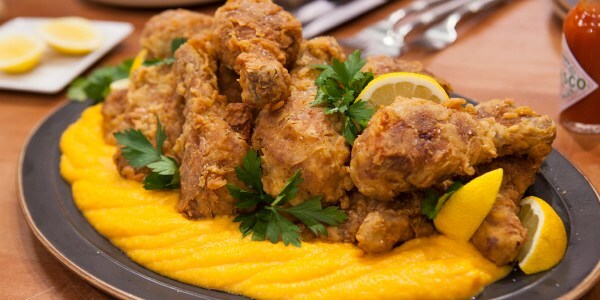 Chef Ryan Scott likes to serve his grandmother's sweet tea-brined fried chicken on top of a butternut squash puree. Yes, turkey is more traditional for Thanksgiving, but either bird works with this creamy side dish that's both sweet and savory. 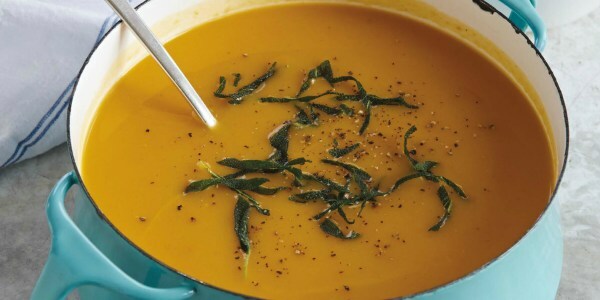 Making butternut squash soup may sound difficult, but it's really quite easy. Simply saute the squash with a handful of other vegetables, add some broth and simmer. Blend the mixture into puree, add some cream and voilà! 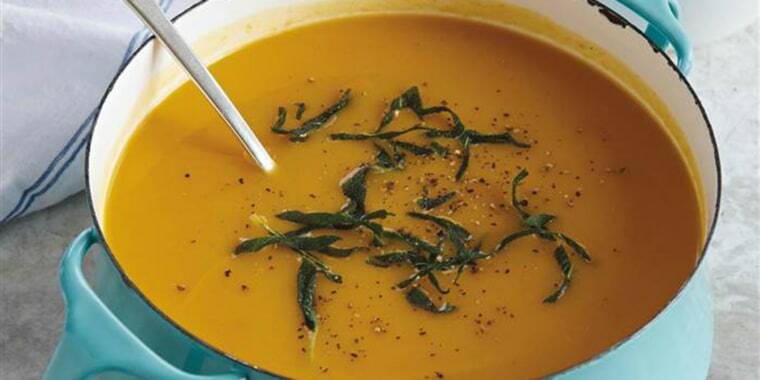 For a fragrant twist, serve this classic fall soup with crispy sage leaves. Food Network star Giada De Laurentiis uses only five simple ingredients for this dish that the whole family will love — visiting relatives and all! Combine rigatoni, Italian sausage, cubed butternut squash, arugula and lots of Parmesan cheese to make this amazing butternut squash pasta recipe that will make everyone say, "What turkey?" The key to the multi-layered flavor of this butternut squash risotto is using one ingredient in two ways. Simply saute one half of a butternut squash and purée the other. 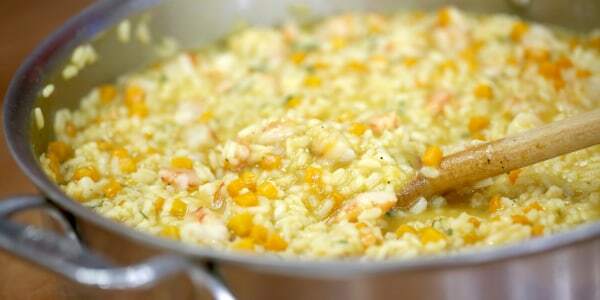 The result is a super creamy risotto with deliciously complex flavors. Simply prepared roasted butternut squash is always a welcome Thanksgiving side dish, but with so many other foods on the table, it can get lost in the shuffle. 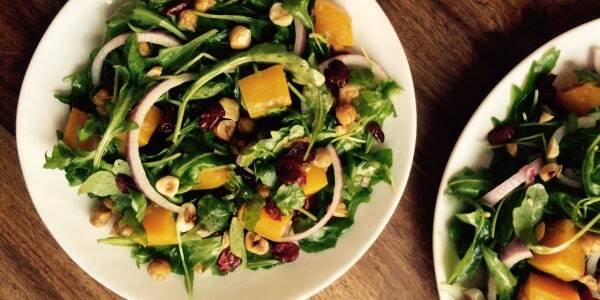 Instead, consider serving it at the beginning of the meal in this healthy and delicious salad. It's loaded with tons of flavor and texture thanks to peppery arugula, crispy chickpeas, toasted hazelnuts, sweet dried cranberries and, of course, the sweet roasted butternut squash. 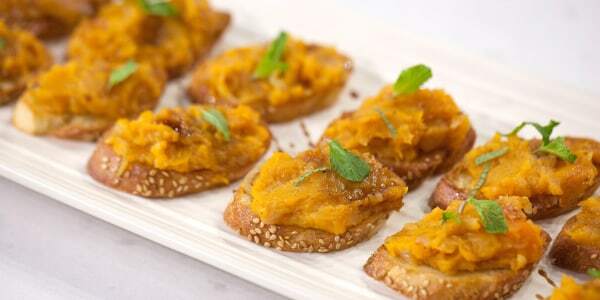 Mix things up this Thanksgiving by smearing crostini with a sweet roasted butternut squash that's been mashed with caramelized onions and seasoned with crushed red pepper. There's some heat to this decadent mash, but a drizzle of tangy balsamic vinegar and a bit of refreshing mint help to balance out the sweet and spicy appetizer. 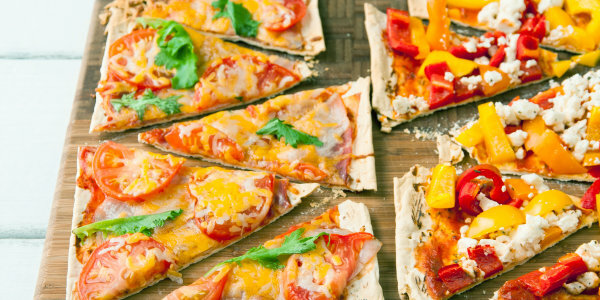 Anyone who loves pizza will be excited to have this tasty flatbread as a Thanksgiving appetizer. Made with sweet potato, red bell pepper and butternut squash, it's a colorful celebration of the best of fall's harvest. 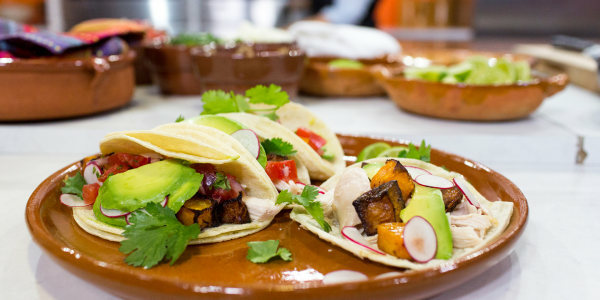 Here's a great idea to mix things up on Thanksgiving Day: Pile shredded turkey into warm corn tortillas, then top the meat with roasted butternut squash, plus more garnishes like salsa, onion, cilantro, avocado, radishes, pickled jalapeños and a squeeze of lime. This also works with any other leftovers, too. 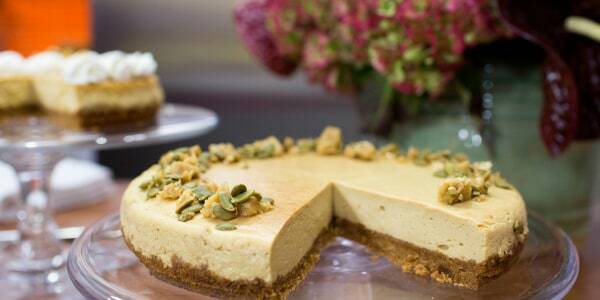 Impress the guests with this stunning cheesecake topped with shards of brown sugar-pumpkin brittle. 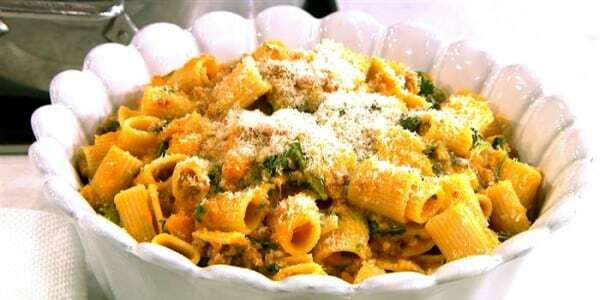 But instead of using actual pumpkin, super star chef Marcela Valladolid substitutes butternut squash. It's so delicious that it may become just as beloved as a traditional pumpkin pie on Thanksgiving Day.